Teenage defenders Andrew Considine and David Donald have signed new deals that will see them contracted to Aberdeen until at least the summer of 2007. 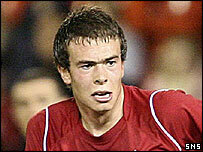 The 18-year-old Considine, son of former Don Doug, has featured regularly in the first team this season. Donald, 17, remains the youngest player in the club's history to feature in the top team when he played against Dundee aged 16 and a half. "I've been an Aberdeen fan all my life so obviously I'm delighted," he said. Considine has been called up to the Scotland under-19 squad after his recovery from a cartilage tear. "I made my comeback in the youth team's 4-2 win over Kilmarnock on Saturday and then played for the reserves against Rangers in midweek," he told Aberdeen's website. "I feel fine and now it's just a case of playing away as well as I can."